Ports are nothing new on Nintendo Switch - in fact, a good proportion of the games that have arrived on the system over the last two years have been re-releases from other platforms - but sometimes a game getting another chance at success on another console is a cause for celebration. 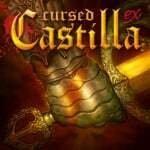 Cursed Castilla EX is one such example. It’s already proved its handheld worth on 3DS and PS Vita, but now this Spanish indie is getting a third swing of the portable blade on everyone’s favourite hybrid device. Just take a few glances at the screenshots below and you’ll instantly recognise the games that have inspired Juan Antonio ‘Locomalito’ Becerra’s gutsy platforming adventure. 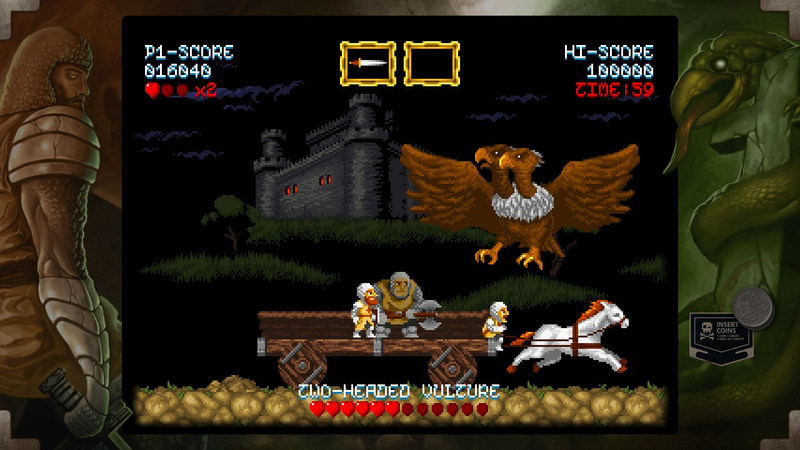 From Ghosts ‘n Goblins to classic Castlevania, Cursed Castilla EX is one of those love letters to games of old where you can sense the developer didn’t just adore the days of side-scrolling hack ‘n’ slashers, but appreciated that those high difficulty spikes were intrinsically vital to their enduring success. Based loosely on the story of Amadís de Gaula (a Spanish chivalry romance from the 14th century), you’ll enter the medieval world of Tolemero as one Don Ramiro, a brave knight who is tasked with banishing an influx of monsters and other nightmarish creatures. Using a number of native myths and folklore as inspiration, Locomalito takes a very familiar genre and infuses it with a regional twist that only serves to make it stand out even more among a very crowded corner of the eShop. 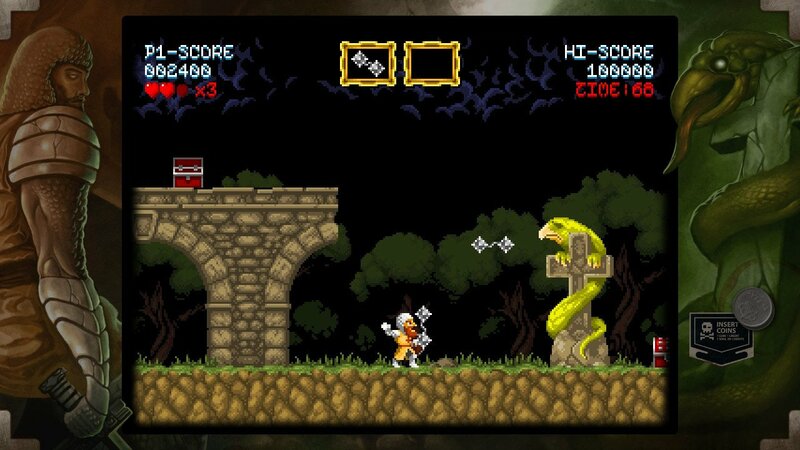 Much like those games it takes so much inspiration from, Cursed Castilla EX is a side-scrolling action platformer all about slashing your way to the end of each level to face a big boss. You start off with a sword you can throw like a mid-range projectile, with the ability to lob your blades in all four directions and when crouched (which helps when dealing with smaller enemies such as crawling zombies or mutated slugs). You have access to a single jump to begin with, but you can grab a pair of winged boots later to help extend the length of your leap. Those power-ups also extend to your weapons, and each one comes with its own set of weaknesses and strengths depending on the enemies that you’re facing. For instance, a set of spike balls can cause lots of damage when thrown, but the fact they spin and twist rather than moving in a straight line makes them less reliable in an intense showdown with a boss or a large number of enemies attacking from all sides. You can also collect more defensive tools, such as a blue fairy that bolsters your attack output or a shield that takes one hit for you without removing one of your hearts. You’ll have a set number of lives, but if you do die you will get the opportunity to restart the current area again. The only caveat is you’ll have to sacrifice the score you’ve achieved in exchange for your resurrection. It’s a neat mechanic that weaves into the game’s deeper replay value. Since most actions net you score - from collecting coins from fallen monsters to collecting items in chests - chasing a high-score run forces you to play smarter and faster. There’s even a speedrun mode for those looking to really test their skills under the cosh of the clock. 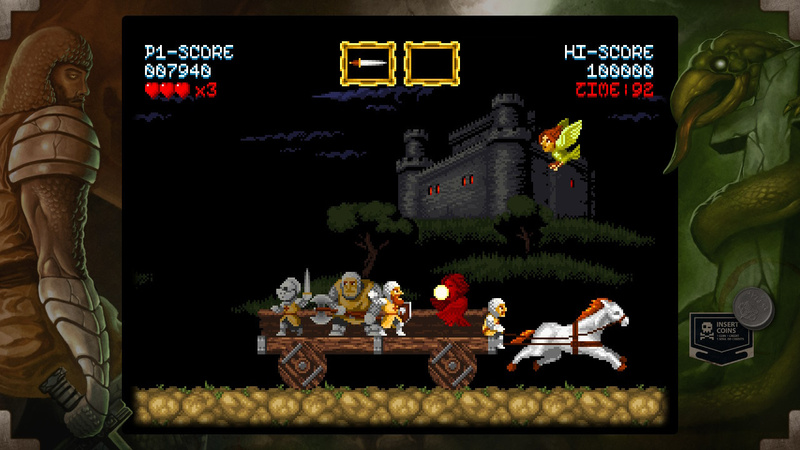 While it’s inspired by arcade classics of old, its Spanish indie developer has included an impressively large number of levels to beat and beasts to vanquish. There are eight themed areas to battle through, 19 bosses to defeat - all of which will test your ability to move and throw under serious pressure - and almost 50 different types of enemy to slay. Each one has a different movement speed and attack pattern, such as executioners that throw axes at you from above and rush you when you share the same platform. While this version doesn’t benefit from the 3D effects of the 3DS edition, it does still have four different view modes (if you really want to recreate that boxed screen arcade look). With Javier ‘Gryzor87’ Garcia’s chiptune soundtrack perfectly evoking gaming’s early years with some top-notch retro VGM, even the moments where Cursed Castilla EX punishes you - and it will, often - will have you tapping your fingers on the back of your Switch as you go. Bosses can be especially tough - even as early as its second big bad - but it’s a challenge that can be overcome through learning to master your jump and attack rather than through sheer luck. While mostly similar to the version that appeared on 3DS in 2017, the Nintendo Switch iteration of Cursed Castilla EX is still well worth a play. Perfectly designed for bite-sized runs on the go, its careful balance of skilful challenge and easy-to-learn controls means almost anyone can pick it up and start throwing swords in vigour. Whether you’re a retro fan looking for a love letter to classics such as Super Ghouls ‘n Ghosts or a newbie looking to see what the fuss is all about, this is a great little adventure. The game looks very fun but does it have the same jump mechanics as Super Ghouls? Or did they make it more of a Mario style platformer jumping? I preloaded it last night, just waiting for it to go live on the US Eshop. I've been wanting to play this ever since I laid eyes on it a couple of years back. Can't wait to get stuck in. I used to really struggle with Ghosts n Goblins on the Speccy and Ghouls n Ghosts on the Megadrive. I don't think I ever got past the first stage of the former or the 2nd stage of the latter. I bought Super Ghouls n Ghosts on Wii VC and actually beat the first run. I was well chuffed with myself but it took a lot out of me. I couldn't bring myself to attempt the 2nd run. Now THIS is how you make a pixel game. Far better than that mediocre Princess Madelyn game. I have had my eye on this one for a while. I did not get it on the 3DS. I would rather play it on the TV. But since I have waited this long and with no shortage of quality games, I will wait for a really good sale or physical release. I love the art style. I will check it out. Not my jam, but sounds like a great game. I love the Ghouls n’ Ghost series!!! But without a proper dpad I will have to pass!! Where’s dpad joycon Nintendo??? Damn!!! Always liked the look of this but I am of the opinion that not making a modern game 16:9 to preserve the retro nature is one step too far for me. Personally thought this game was overrated, but to each their own. While I love this game on 3DS, I don’t think I’ll be double dipping. @AG_Awesome I've just started playing it and first impressions are very good. Jumps are more like SGnG, as in you can't change your direction when jumping but nowhere near as awkward. The character feels really good to control actually. From what I've played it's everything I'd hoped it would be. I suspect the superior version of this game is the 3DS release. From what I played, the stereoscopic 3D was really nice, and having a proper d-pad for it is great! Personally I am pretty tired of these modern indie games that pretend to be SNES games. @Valdney The proper D pad is on the NES Joycons that you can buy if you're an annual subscriber to Nintendo's Switch Online service. If you love platform games these NES Joycons are well worth it. @John_Deacon Well, Nintendo do on the NES Joycons sold to subscribers of the Switch Online service. Worth it if you love platformers. And they're the perfect way to pretend it's 1985! @AG_Awesome This is Ghost n Goblins not SGNG in comparison, It doesn't have a floaty double jump, Nintendo life just making a lazy and incorrect reference. The game is fantastic but as you'd expect very tough. @JayJ I agree that there are too many and the majority fail to pull it off but this one really nails the look and feel. I'm really enjoying it. It's tough but not frustrating and looks great on the big screen. @Lionyone Can I use them in handheld mode?? Then no, thank you, they’re worthless to me. These 2d side scroller pick up and play games are almost meant to be played in handheld mode. @Valdney Sorry to hear that's the only way you play as I'm not sure Nintendo have enabled the NES controllers to have handheld mode. I'll ask Nintendo if there's a way of doing it. But I can tell you that the super accurate NES controllers are an absolute joy to use wirelessly and they are so fantastically light that in two hands a NES controller feels it weighs almost nothing. It really adds a dimension of pleasure to platform games to use these controllers.